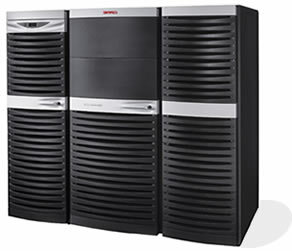 The AlphaServer GS320 is designed for the highest levels of application performance. AlphaServer GS320 is ideal for e-business and other critical enterprise applications with requirements for high availability or rapid growth. A powerful, scalable server with up to thirty two 1.224 GHz Alpha EV68 processors, it provides ultra high availability and innovative architecture for managing massive data in record time. AlphaServer GS320 's modular structure allows you to purchase only currently needed infrastructure and CPUs, while still preparing for explosive growth. Single system management lets you add capacity without adding people. Unique partitions allow mixed operating systems on the same server for workload management and server consolidation. Runs Tru64 UNIX, OpenVMS, and Linux Developer's Kit. � Copyright 2007-2013 MIT Limited,UK. All rights reserved.